Standard - €76.99 Only 4 left! The Great Barrier Reef is among the most beautiful places on planet Earth. So amazingly colorful and full of exotic creatures, this wonder of the world has been the setting for a handful of films and used in plenty of literature. Now, you have the opportunity to bring the beauty and fun of the Great Barrier Reef to any costume party you attend. All you need is this Adult Clownfish Costume and you’re set to go! Toss on this orange and white hooded tunic and you’ll become the life of the party. Everyone loves a clownfish, and it’s not just because they’re so funny. Their vibrant colors and graceful swimming wins everybody over. So even if you aren’t the funniest person in the room you’ll still be the most popular fish in the party sea-n. The only thing you’ll need to worry about finding in this costume is a big ole glass of water to stay hydrated on the dance floor. This costume will also be great for a family trip around the block to collect treats on Halloween. Your kiddo can dress up in a child’s clownfish costume and you can swim around the block on an aquatic adventure! So if you’re ready to remind everybody this Halloween about the wonder and beauty of the Great Barrier Reef, you know what to do! 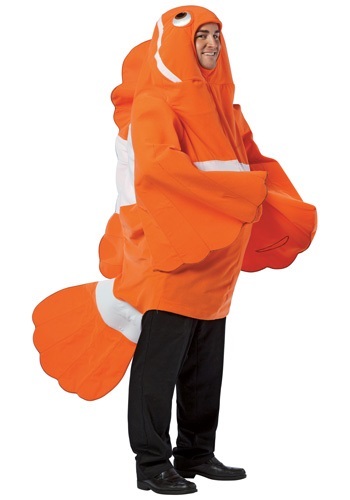 Just grab this easy to toss on Adult Clownfish costume and let the fun begin. Just watch out for any exotic fish collectors. You wouldn’t want to spend your Halloween night in a fish tank!